It’s no surprise that Social Donors operate with a different mindset than traditional nonprofit supporters. While they might have heard of your mission, they aren’t deeply connected to the cause before giving. Typically Social Donors were invited to your fundraising event or peer-to-peer campaign by a friend or someone in their social network. It is these personal connections that spur them to get involved in a fundraiser. Because Social Donors are often first-time givers, nonprofits have a unique opportunity to convert these supporters into repeat givers. With donor churn around 45.5 percent, finding new donors is critical part of any nonprofit development strategy. Once the initial gift is made, there are key levers that can highly influence your nonprofit’s likelihood to convert Social Donors into repeat and/or regular donors. Use these levers as a road map to turning a one-time giver into a repeat donors, or even better, a year-round supporter. The donor experience is central to keeping Social Donors as supporters. 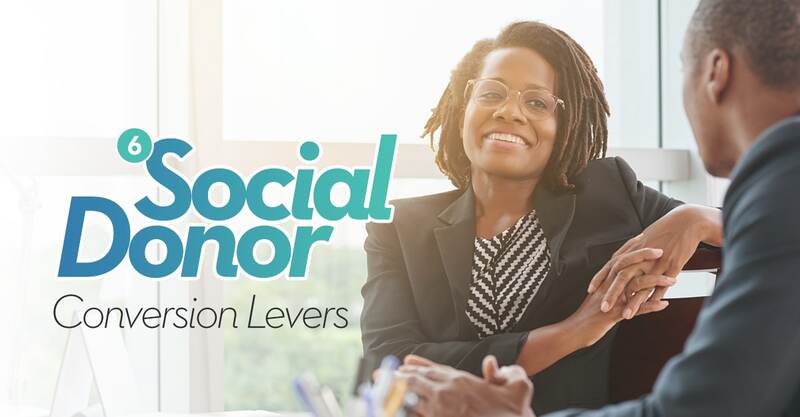 We’ve created the Social Donor Conversion Funnel to help nonprofits understand what they can do to maximize Social Donor retention. The key lies in your organization’s ability to maximize the donor experience at each stage of the conversion funnel. As you can see in the figure below, 54 percent of Social Donors say they will likely donate again to the same organization (yes, more than half), and 28 percent of this group say they are likely to become regular monthly or annual donors (that’s almost a third with a likelihood to become year-round supporters). This can mean an influx of new donors to your fundraising, only if you take the time to cultivate them the right way! The ability to convert Social Donors into repeat or even regular donor won’t happen on its own. You need to understand what they value and why they give, in order to foster a lasting relationship. Each step of the process from the initial communications donors receive to the giving experience and follow-up,impacts not only their perception of your cause, but whether they want to stick around. Dealing with Social Donors is all about establishing a long-term connection and moving them along the donor journey to loyal supporters. We laid out these six levers to help your nonprofit team increase the likelihood to convert Social Donors into loyal supporters. Social Donors are unique in that they are actually aware of and involved with the end goal of an organization compared to other types of donors that might be motivated by recognition or praise. Most Social Donors are highly likely to become repeat donors for an organization that is clear and explicit about the effect their donation will make down the road. TIP: Make sure mission messaging, impact statements, and quantifiable results are central to all Social Donor communications. Paint the “Why” of you nonprofit and how their indvidual donation plays a part in building a larger good. While this conversion motivator deals mostly with those who give at fundraising events , it can still be applied to other types of Social Donors. Think about how exciting or enjoyable your campaign is. Does your fundraiser resonate with attendees even after it’s over? Do donors receive updates from their friends or peers about your organization after they’ve given money? It’s all about making a one-time event (or donation) feel like a lasting, engaging relationship. TIP: Throw out templated pre and post-event communications. Think instead about how to leverage social groups in follow-up communications. Tailor communications to include the social networks and personal connections that brought the Social Donors to your cause. P.S. – don’t forget the mission and impact too! Nothing turns potential long-term supporters away more than a difficult, clunky donation process. Because many Social Donors are first-time donors ,you want to make sure you remove any barriers to the gift. . Your team should be constantly looking for new ways to simplify and improve the giving experience. TIP: Time to seriously examine those manual donation processes! They are dragging you and your cause down with Social Donors. Embrace online and mobile giving. Make it easy and give them an easy process to repeat donations. This is where the overarching mission and value of a nonprofit comes into the spotlight. Does your event, campaign, or social challenge deliver an inspirational, forward-thinking message to attendees and supporters? Is there a lasting message that people can take and pass along to others? TIP: Graphics and quick videos can tie your mission, their gift, and the difference a contribution made into a simple but effective communication. Showing gratitude, connecting them to your cause will help move them further on their journey to repeat supporters. When first-time supporters make a donation, they want to know exactly how that financial addition will make an impact on your organization’s long-term goals. Map out a detailed follow-up communication plan that includes pictures, videos, and testimonials from recipients of financial contributions. TIP: To build a more loyal and sustainable donor base, spend as much time on your post-gift communication strategy as you do attracting Social Donors to your events and campaigns. Tell them in every communication why and how their donation matters! Although recognition isn’t a top motivator for Social Donors, 31 percent of donors say that a proper thank you from a nonprofit impacts their decision to donate again. Saying thank you is standard operating practice for many nonprofits. For Social Donors, follow-up is core to their conversion process. Be sure to continue to reinforce your mission, the values and heart of your organization, to build that deeper connection. TIP: Get creative and stay in touch! Segment your Social Donors and create a personalized follow-up series with multiple touchpoints, referencing back to the event, campaign or challenge. Want to learn more about Social Donors? Check out our newest report, Social Donor Study: Understanding Motivators and Giving Behaviors.